Internationalization involves Globalization and Localization. Globalization and Localization are critical aspects of many web applications, which are best considered early on in a project. This article explores the internationalization features provided by the ASP.Net Core framework, including defining allowed cultures, content localization and the culture selection per request. Apart from out of the box functionality, this article will take a look at how to use an optional url segment to localize your contents. This way your application will respond to urls like /Home/About, /en/Home/About or /es-ES/Home/About with localized contents. This article will also demonstrate how the ASP.NET Core framework can be modified to match your requirements, creating new conventions and service implementations that you can easily include when composing your application. ASP.Net Core provides a localization specific middleware which can be added to the pipeline by calling app.UseRequestLocalization. When you add this middleware to your request pipeline, you can provide an object defining the cultures available in your application, plus the default culture. · UICulture is used when localizing strings, for example when using resource files. You will also see specific cultures and neutral cultures. For example, the culture “en” is the neutral English culture, while “en-US”, “en-GB” and “en-AU” are the English specific cultures for the United States, Great Britain and Australia. In the previous section, we have seen how to define the available cultures, but how is one of these selected for each request? When you use app.UseRequestLocalization you are not just defining the available cultures, you are also defining the RequestCultureProviders. These objects inspect the incoming request and try to find out which culture should be used by inspecting the request, each different provider following a different strategy. The providers are evaluated in order; the culture will be taken from the first one that is able to determine it. Once a provider determines a culture specified in the request, it will then be crossed with the available cultures before finally selecting the culture for that request. If a specific culture which isn’t available was determined, the generic culture will be used if possible. Otherwise the default culture will be used. If no provider is able to determine the culture, then the default culture will be used. QueryStringRequestCultureProvider. 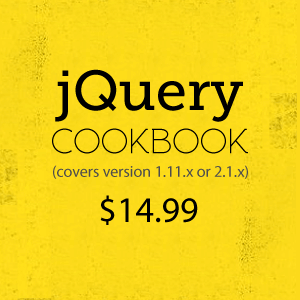 Looks for the query string parameters culture and ui-culture. If only one is found, then that value is used for both the Culture and UICulture. CookieRequestCultureProvider. Looks for a specific cookie which can be set with the static method CookieRequestCultureProvider.MakeCookieValue and whose default name “AspNetCore.Culture” is taken from CookieRequestCultureProvider.DefaultCookieName. AcceptLanguageHeaderRequestCultureProvider. Looks at the Accept-Language header in the request. These default settings might be enough for your application, especially if you provide some UX where users can pick the culture, triggering an action on your server that sets the AspNetCore.Culture cookie. While the default route matches urls like /controller/action/id, the additional culture aware will match urls like /culture/controller/action/id. The culture segment will have a regex constraint so only valid culture strings like “en” or “es-ES” are allowed. It should be added before the default route so it is evaluated first. Otherwise the culture string would be taken as the controller name! You also might want to consider attribute routing. It is less straightforward than using the route tables since routes are not defined in a central place. One option would be making sure you add the culture segment to every api controller using attribute routing. Another option would be creating a base controller class for your api controllers that use attribute routing, where you ensure the routes will always start by /api/culture/controller or /api/controller. The better option would be creating your own convention for api controllers! The urls will always use the controller class names. If you want to redefine it and use something other than the controller name, you would then need to add route attributes to your controller but these attributes should contain the api and api/culture prefixes too! A better solution of adding your own convention is not too complicated and is the preferred way for customizing ASP.Net Core in many scenarios. 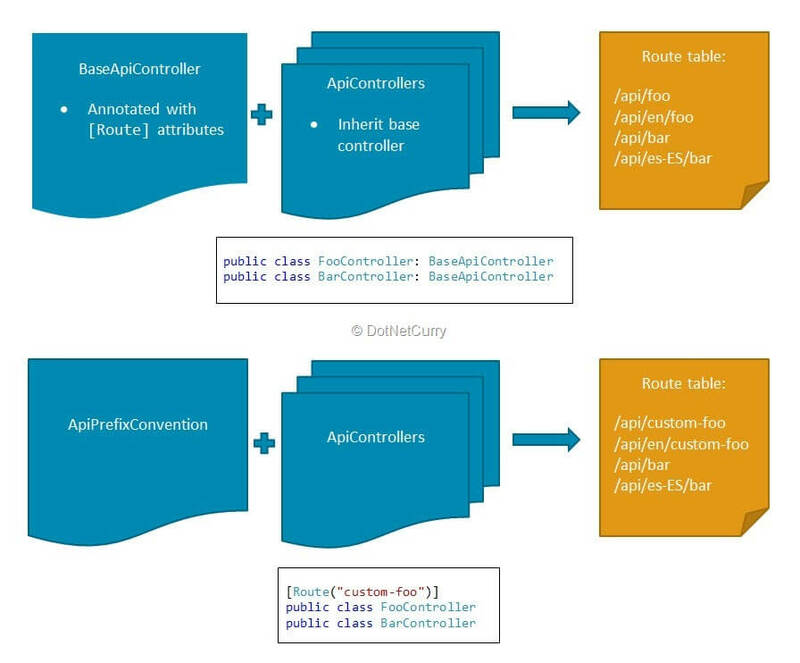 Custom conventions are created by implementing the interface IApplicationModelConvention, which exposes a single Apply method. The method receives an ApplicationModel object, which contains most of the metadata concerning your application like controllers, routes, actions, etc. This metadata can be altered within the convention’s Apply method, letting you creating your own conventions. The convention approach gives you greater flexibility while it does not impose any constraints on how you should create your api controller classes. All you need to do is making sure you api controller names end with …ApiController. Right now, you application supports routes with a specific culture segment like /api/es-ES/hello-world. Let’s create a new RequestCultureProvider that inspects the url of the current request and looks for the culture segment. Inspect the request url for a culture parameter. If a culture parameter is found, return a new ProviderCultureResult with that culture. If no parameter is found, return null. This means the localization middleware will try with the next provider; if no provider is able to determine the culture, then the default will be used. So far we have seen how the available cultures can be defined, and how one of those will be selected for each request. Now let’s take a look at how to provide content which has been localized to that culture. As you can see, one option uses folders while the other uses dots to organize your files. Alternatively, instead of using the IViewLocalizer service you can also create culture specific view files. This is done with the AddViewLocalization(LanguageViewLocationExpanderFormat.Suffix) line of the StartupConfigureServices method. Instead of creating different resource files for a particular view, you can directly create different views that contain localized content like About.es.cshtml and About.en-US.cshtml. ASP.Net Core provides out of the box good support for Internationalization, which you can easily take advantage of when creating a new application. As with the rest of the ASP.Net Core framework, it comes with sensible default options and implementations. When these defaults are not good enough, many times you can just use different options, others you will need to create your own implementations of the required services. However extending or replacing the default functionality is not as hard as it seems. The UrlRequestProvider and ApiPrefixConvention created in this article are good examples of how to take advantage of the extension points provided by ASP.Net Core and implement your specific requirements in a very clean way. One final word, there is more to it that what I could cover here! The asp docs site is a good starting point if you need to dig deeper.